This beautifully designed and detailed outdoor nativity set silhouette will touch your heart at every glance. It is the perfect display to celebrate Christ's birth and share that joy with your neighbors. 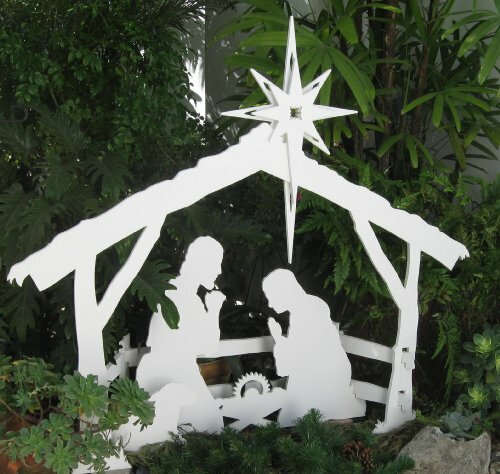 This outdoor nativity set is made in the USA of the highest end, UV protected, solid PVC sheets available. Assembly is quick and easy. Most people don't even look at the instructions. It ships in a custom designed box that can be used to store your nativity between the seasons. No fasteners or screws are needed. The nativity is secured into place at 4 tie-down points with stakes hammered into your soil. 'MyNativity' is available in four sizes and all of them come with the beautiful penetrated star that allows lights to be put in or through it (as seen in some of my photos). I have been adding new characters to the set every year since 2008. Currently, I have an ox, a donkey, an angel, a shepherd (that comes with 3 sheep and a dog), a father and son shepherd set (that comes with 2 sheep) and the three wisemen (that come with a camel). I also have 5 Christmas Messages. "Peace on Earth", "Joy", "Merry Christmas", "Noel" and "A Child is Born". These nativities are absolutely the highest quality products I know how to make. They are gorgeous, simple and calm. They share the true spirit of Christmas. I promise, no matter which size you choose, it is the best outdoor nativity set available. Easy assembly & storage, this lawn nativity set assembles in minutes. No fasteners or screws required. Medium: 47" wide x 45" tall x 11.25" deep. Size options perfect for a large home, church, hospital, or business this Christmas season.